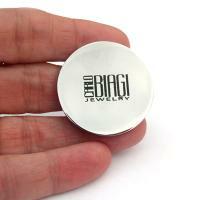 This Tiger Eye Carlo Biagi Coin Cabochon is a dome shape semi-precious stone made to create a unique pendant. This Coin is Silver Plated and interchangeable with other coins in a holder to mix and match for a modern pendant necklace. Similar to Nikki Lissoni or Mi Moneda. Price is for one coin. Coin holders are sold separately.